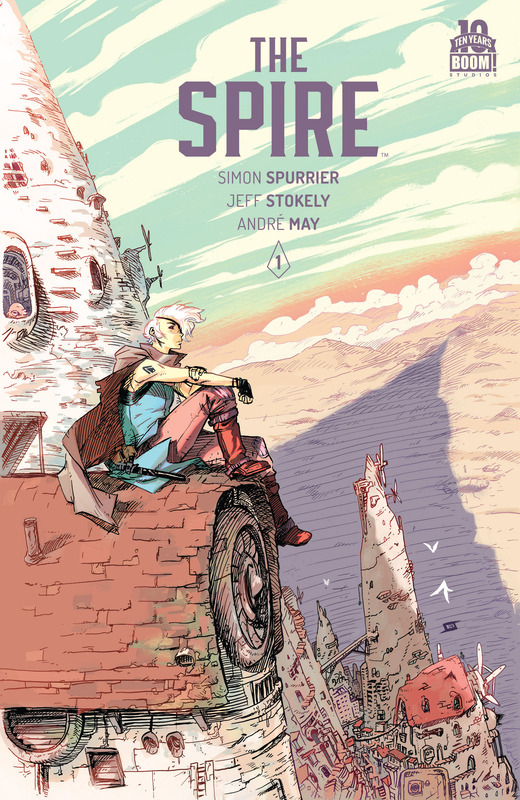 There is so much to this cover to enjoy as Jeff Stokely gives a glimpse at the peace that can be found on the dizzy heights of The Spire. A graceful tranquility is brought about by the darker inking of the detailed rooftops in the shade and the softer lighter strokes in the brightly lit and distant landscapes. This is shown very nicely by the central character, Sha, having darker shades around her boots and whispy strokes around her hair. Combine this with the lovely light blue and pale colours of the sky contrasted with the darker shaded of the central city hub and you have two very different landscapes. The perspective is all important because the shadow of the tower is cast long and far across the desert, as well as the depths of the city being shown in the smallest of details. This instantly gives a rationale to the chose resting location of our protagonist, as she looks out across the luminous arid lands, ignoring the gloom of the commotion below. It is a beautiful scene and gives a great introduction to the city in which this book is set. The name Spire and the height at which Sha sits gives the impression that this city is built upwards but not outwards, and it is plunged into darkness as the peak looms over it. It is also quite apparent that there is little rest to be found in the Spire because to ascend to the peaks is a long way to travel just to relax. But where Stokely truly succeeds is conveying a sense of harmony and calmness, just before we open the cover and enter the darkness of the world below. Next PostThe Theatre List 1/7 – Who needs reboots and crossovers?